Versatile and ideal for active lifestyles! This lightweight Elevate Vega Tech Quarter Zip Custom Jackets is made of breathable and moisture wicking micro polyester. Ensure employees stay warm with this Carhartt Duck Traditional Custom Coat! The arctic-weight polyester insulation and durable duck cotton makes this coat ideal for the winter climate. Versatile, rugged, and warm, this Carhartt Quilted Flannel-Lined Duck Active Custom Jacket is water-repellent and wind-resistant! Battle Old Man Winter and everything it throws at you with this name brand jacket. Lined with aluminum sheeting, this RFID Protected Promotional Smart Wallet protects important information found on credit cards, hotel keys, and more! It holds one card at a time. 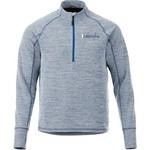 Made from 100% polyester fleece, this Spyder Constant Full-Zip Custom Sweater Fleece provides warmth especially during colder months. The men's Elevate Asymmetrical Performance Custom Polo Shirt offers eye-catching asymmetrical details. The moisture wicking and material is not only breathable it offers UV protection. Perfect for the golf course! This classic Carhartt Thermal-Lined Duck Active Custom Jacket is water-repellent and wind-resistant, making it ideal for the outdoors! It features a polyester thermal lining and a hood with a drawstring closure. The women's Elevate Asymmetrical Performance Custom Polo Shirt offers eye-catching asymmetrical details and soft v-neck to offer a feminine touch. The moisture wicking and material is not only breathable it offers UV protection. Perfect for the golf course!